If I’m ever stumped on what to do with a mysterious vegetable, there are a few places I turn for inspiration, and Smitten Kitchen is one of them. I am such a fangirl! I was looking for a spaghetti squash recipe that didn’t pretend the squash was something else, like actual spaghetti, since Mom sprang that one on me as a kid and I haven’t been the same since (sorry, Mom!). My beloved SK delivered a lovely recipe and here is my spin on Smitten Kitchen’s Moroccan-Spiced Spaghetti Squash. She suggests adding chickpeas if you want to bulk it up, so I did, since more veg-based protein is this girl’s best friend, and who doesn’t love a chickpea? We devour this with a few other veg-based dishes for a highly satisfactory dinner. To cook the squash: Did you know you can microwave it? It’s super easy! Wash the squash and pierce it all over with a knife (so the steam can escape and it doesn’t explode… that would be unfortunate). Just stick that bad boy in the microwave and cook it on high for 6-7 minutes. Turn over and cook another 6-8 minutes (depending on your microwave’s power and the size of the squash). It should feel soft when it’s done. Cool squash for 5 minutes, then cut it in half (be careful, lots of steam will escape), scrape out the seeds and throw them away, and spoon out the spaghetti-like strands into a medium bowl. Not into microwaving? Refer to the original recipe for oven method. To make the spice and chickpea mix: Measure out your spices into a small bowl (cumin, coriander, chipotle, salt). (This is so you don’t burn your garlic by measuring them all individually when the time comes to add. You can thank me later.) Melt the coconut oil or butter in medium saute pan over medium heat. Add garlic and stir until barely golden. Add your spice mixture and stir over heat for a few seconds until it becomes fragrant. Add the chickpeas, stir to coat chickpeas in spice mixture, cook for 1-2 minutes, and turn off the heat. 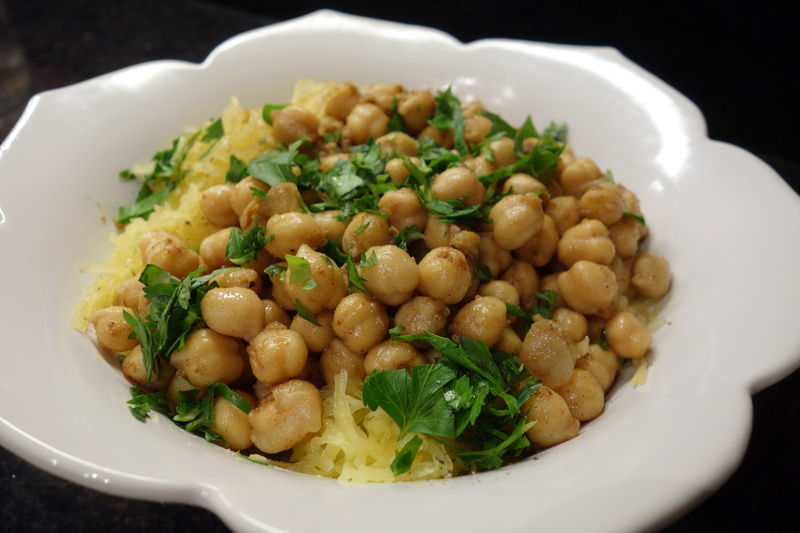 To assemble: Take your medium bowl with the spaghetti squash in it and spoon the spice and chickpea mixture over the top. Toss all together, topping with the chopped parsley or cilantro as desired. Enjoy! This is a radish*rose original recipe, adapted from Smitten Kitchen. All images & content are copyright protected. All rights reserved. Please do not use my images without prior permission. If you want to republish a recipe, please credit radish*rose and link back to the recipe.